The general assembly and global conference of the International Co-operative Alliance brings together Alliance members and the global co-operative community for three intense days of connecting, learning and setting out the course for the co-operative in the years ahead. 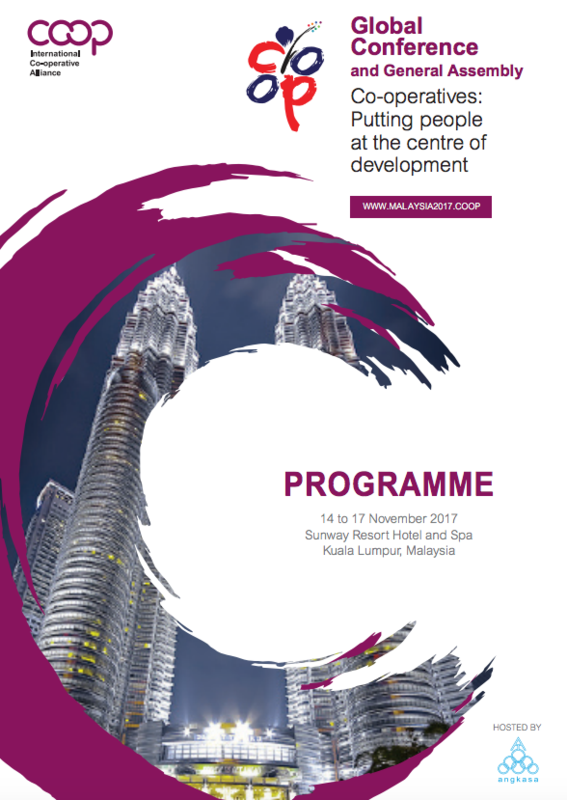 Hosted by Angkasa cooperative in Kuala Lumpur, Malaysia, the event is focused on "putting people at the centre of development." Cooperatives Europe will be present at this year’s General Assembly from 13th to 17th of November. The event will also mark a change of leadership with the upcoming election. Click here to find out about the candidates. The three-day event will explore the latest developments in the cooperative movement worldwide, see a number of workshops and talks as well as explore cooperative stories through exhibitions and demonstrations. The ICA-EU Partnership will host a #coops4dev session on international cooperative development on the 15th of November, from 11h00 to 17h30. See the programme here. The Cooperatives Europe Development Platform (CEDP) will also participate to the event. On November 14, the CEDP will meet with other international development organisations to discuss the advancement of the International Cooperative Development Platform. CEDP members will also be featured in the #coops4dev photo exhibition on the theme of Sustainable Development Goals (SDGs). Importantly, the conference will mark the occasion to disseminate two new CEDP publications on good practices in international cooperative development, to be released prior to the event. Follow the event on CoopsEurope storify page, updated daily.